Yesterday I headed off at 6.30am on a flight out of Luton on a bit of “unfinished business” This involved walking boots, a trip to Glasgow and enough cereal / protein bars to sustain a small village’s nutritional needs for a month. 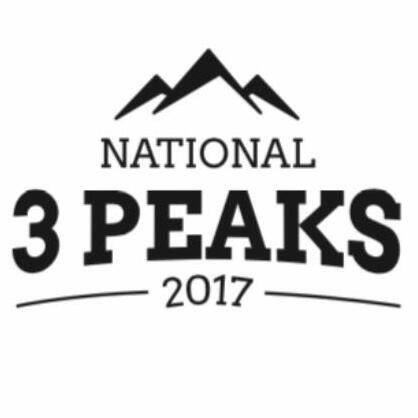 The challenge, the National 3 Peaks. 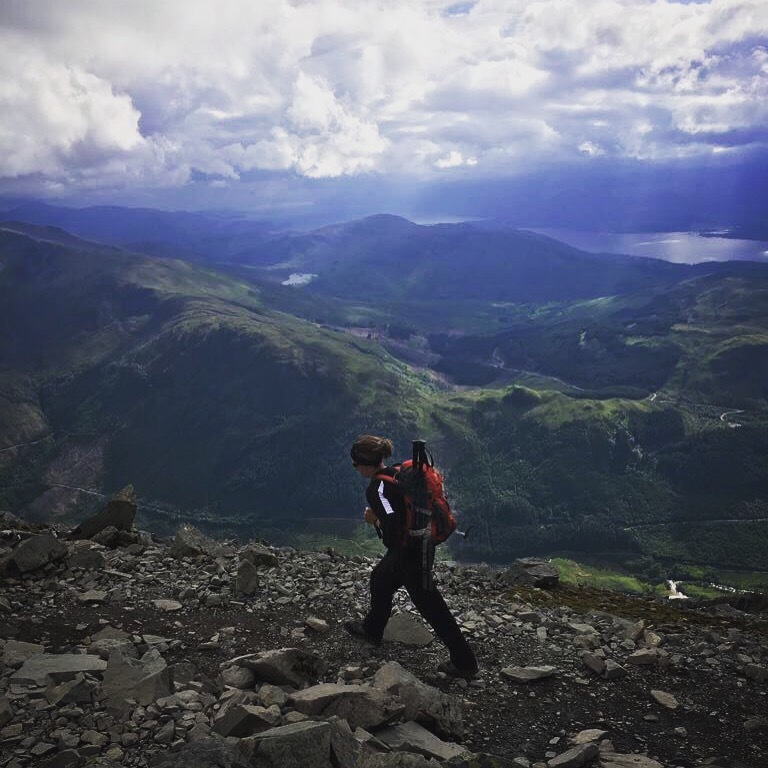 The 3 highest peaks in the UK to be climbed and conquered in 24 hours. 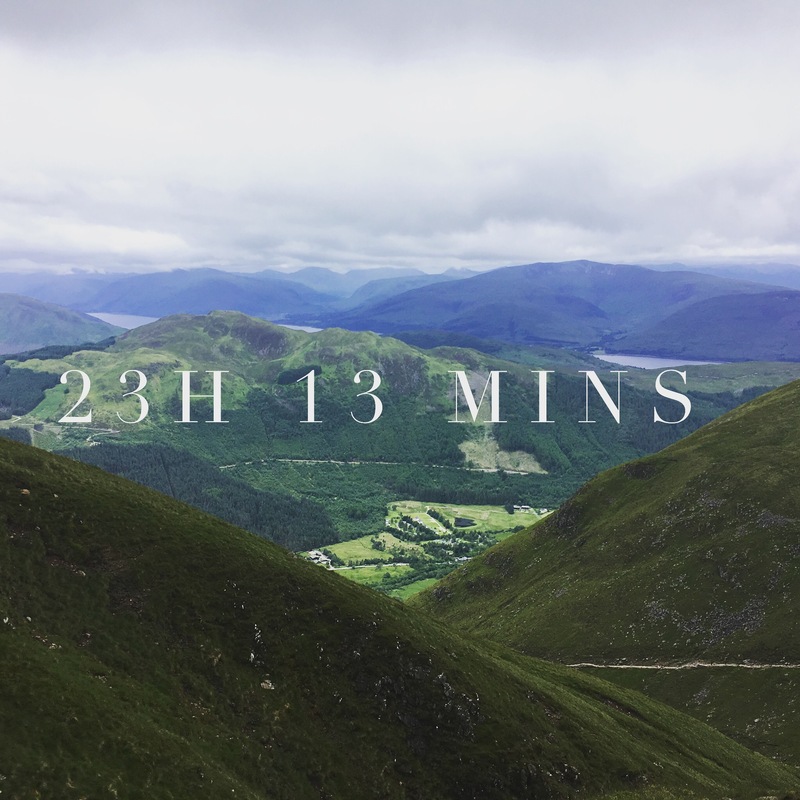 This equates to approximately 26 miles of walking, at least 12 hours of driving between Scotland, Cumbria and Wales. The fore mentioned 10 tonnes of energy bars, snacks and jelly babies. 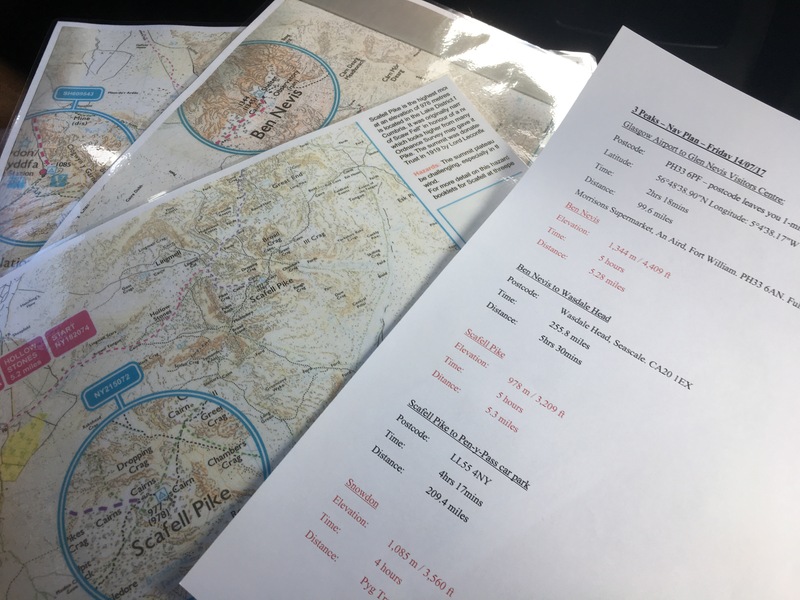 A schedule and packed bag that the military would be proud of with a strict no faff policy, efficient, speedy loo breaks, and rally driving between mountains to make up as much time as possible allowing more flex for whatever eventuality is thrown at us on the mountains. Bags packed with clothing that anticipates any combination the elements offer up, from rain, snow, sun, wind, sleet and fog – all while you folk at home are no doubt basking in the forecast sunshine. Training over the past month has been lacking somewhat, parental duties, work life, social commitments have meant that even my usual exercise habits have gone out the window. An 11 mile night walk after work one night at pace was all that we managed to fit in. However in some ways we are more prepped than most. 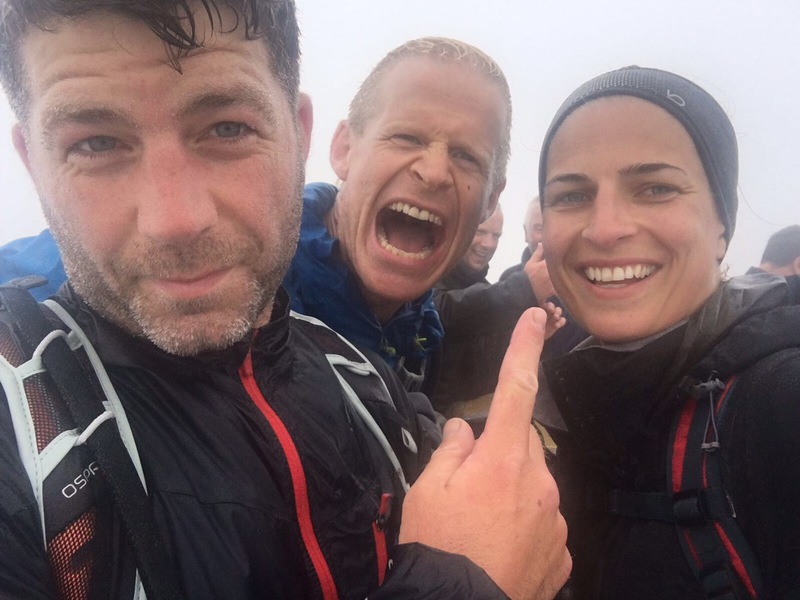 As literally 4 weeks ago I also found myself on a flight to Glasgow at the same time in the morning to conquer the 3 Peaks. Unfortunately though we didn’t make all 3. The weather was never set to be great and hazardous winds and rain were set to be a given. Fortunately we managed to miss most of the rain, got battered by 40 mph winds at the top of Scafell Pike which were literally as breathtaking as the Ben Nevis views. By the time we hit Snowden we were passing people telling us not to bother as they were forced to retreat down due to the winds. Obviously, despite the warnings of our guides, we ploughed on. Roughly 30 mins from the top having all been individually blown over at various points, with the wind howling and the repetitive commands from our guide hollering “BRACE, BRACE” as we hit the deck due to the inability to again literally stand up to the 70-80mph winds. So we were forced to call it a day and head back down defeated by Snowden. Our June trip was not a cheap one. A group of 11, a mini bus, a couple of drivers, flights, an overnight in Birmingham once we’d finished, all the required kits. 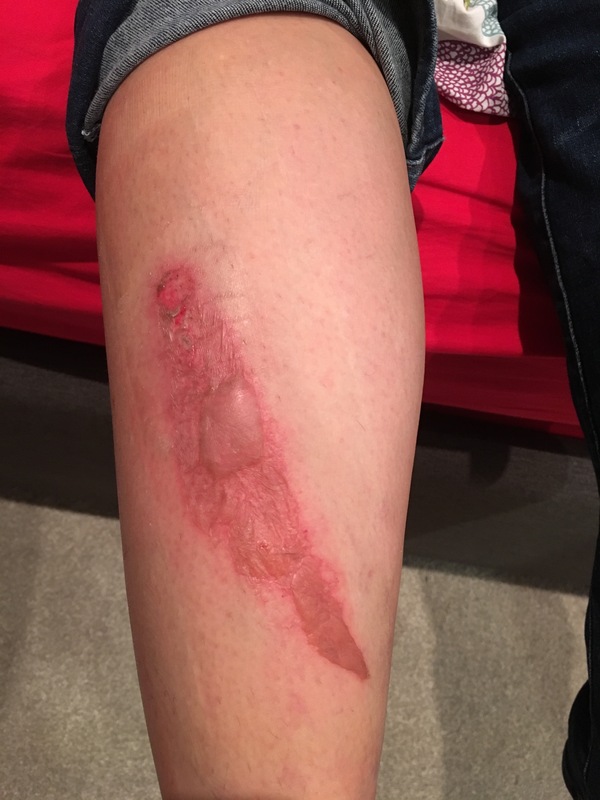 Plus some medical costs of a nasty boiling water induced, turned infected, burn after Nevis. This came in probably at about the £450+ mark. So the decision to do this again was not an easy one, especially when we were under taking it as a couple therefore doubling the cost. So this time the luxury minibus was replaced by a hire car, the group whittled down to 4, the hotel stay axed, the drivers eradicated, meaning a gruelling challenge has just been hit with an additional layer of sleep deprivation as between us we were sharing the driving. Then heading straight back from Wales to life, work and the kids on Saturday night. Many have asked “Why?” claiming we still did it, did well and should be proud. Simply we didn’t finish. Imagine (if you are this way inclined) that you had trained for a Marathon. Imagine then if at 23 miles you were asked to stop and didn’t complete it. Have you run a marathon? – No. You would no doubt be exceedingly pissed off and at some point do it again. Yes you could try for a year later but actually you are currently trained, fit and ready. Why build it up from scratch again? It’s actually logical to go for it again while you are still “match fit”. So with the mantra that sleep is for losers, a tight schedule, the hope of “muscle memory” plus the grit and determination to not want to have to do this for a third time driving me forward we headed off! 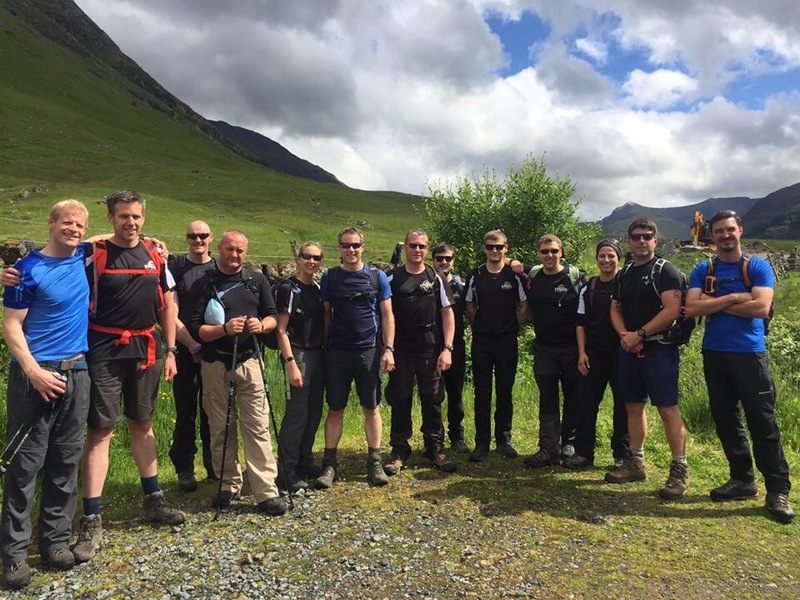 Ben Nevis was once again gruelling. The large steps and steep incline from the off have your heart pounding out of your chest and offered up immediate labourious breathing. The first hour or so is undoubtedly the worst but it is a hard slog all the way up. About 30 mins before the summit we were rapidly shimmying into waterproofs and the rest of trek was wet and once near the top paired with annoyingly cold, face pinching wind. However we made it to the summit in 2hrs 40 mins and were down back in the car park after 4hrs 40 mins. Wet and bedraggled but a +30 mins improvement on our previous month’s time. Fuelled up by a cheeky drive through McD’s (a Quarter Pounder with cheese literally never tasted so good) sponsored by Soreen and Muller Rice we were on our way for the 5+ hour drive to Scafell Pike. 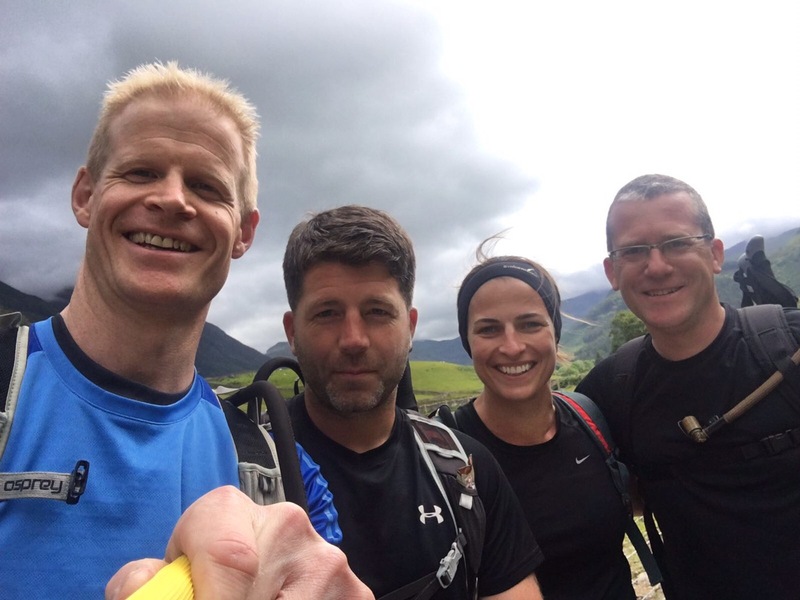 Again making great time, narrowly avoiding sheep, pulling 2 wheelers round country lanes with a few hairy moments we were swiftly out the car and good to go up Scafell Pike at 1.30am. 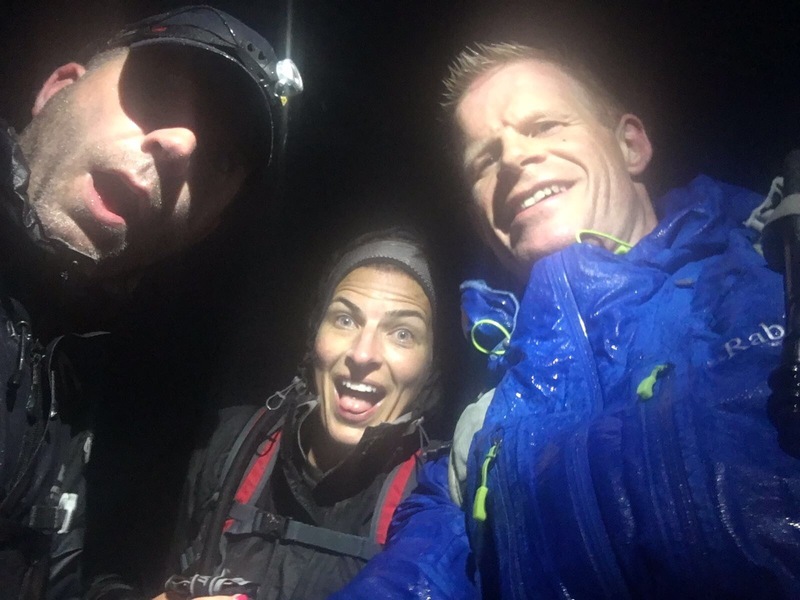 It was dark, ridiculously dark and very, very wet! We achieved a great 4 hours (thankfully) but it was hard. First we were sadly down to 3 as one team member had bowed out as he wasn’t feeling fighting fit and was concerned he would hold us back. 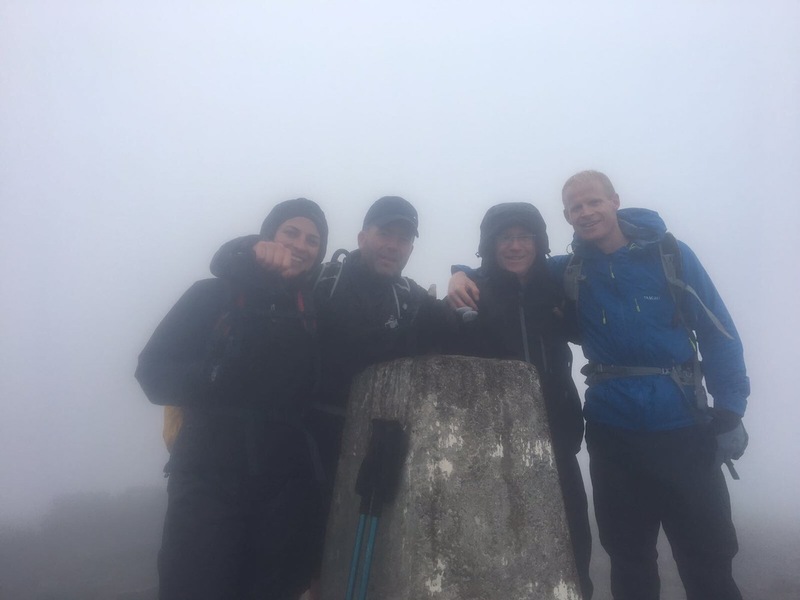 The climb in my eyes was less challenging on the body but we literally couldn’t see a thing! The visibility was shocking, we relied completely on the recent memories of our previous trek to guide the way. Disaster struck when our combined gut feel told us we were lost, we were in unfamiliar territory, felt we had gone far to far left and couldn’t find any of the required markers. We kept climbing but at times were stumbling completely “off road” away from any kind of path, clambering over boulders, moss and seemingly untouched land. With the view that we had been defeated once again, and that we had thrown into the darkness our shot at 24 hours the mood was tense. Suddenly like saviours from above, from the depth of night we saw bobbing head torches ahead! I could have literally embraced the whole team coming down the mountain. Never had I been so glad to see a bunch of cold, wet people in my life. We had gone a strange way but had stumbled back on course. The last 30 mins to the top was equally hairy as we guesstimated the right way to go in the thick fog, rain and darkness but we got there. Coming down we stumbled off the path repeatedly until it started to get light but we were back in with a shot. Back in the car it was an impressively swift 4 hours to Snowden. This drive and the previous time saving trek had bought us the luxury of flex and time. Things were looking good as we had a 5 hour window to do a probable 4 hour final walk. The weather was once again not our friend, and now quite comfortable with the feel of wet clothes and trousers feeling like they were going to slip off due to the added weight of water, on we went. The start of Snowden was trickier than I remembered as once again I was not a fan of the large step like boulders. Once we got to what had been the end of our challenge a month ago we were buoyed on by new territory. The mistake here was having in my head that we had last time been forced to turn around 30 mins from the summit due to the wind. Realistically it was a further 90 mins or so to the summit and a ridiculously hard 90 mins of never ending climbing, forcing now very sleep deprived, unresponsive legs onwards and upwards. In my mind I was eternally grateful that this wasn’t the 4 Peaks Challenge as I had very little left. Encouraged that the climbing was behind us and that we just need to get down, we stormed it down the Miners track, a steep vertical route down followed by a 3 mile plateau back to the car park. The boys jogged this last bit but happy to have successfully achieved a sub 24 hour time, I was content to power walk back coming in 13 or so mins later and ecstatic that there would be no need to put myself through this enduring challenge again. Next Post Wherefore art thou summer?